I have run again the Python code that computes the worst-case (red) and best-Case (blue) posterior distribution for Clinton winning the general USA election. using fresh (September) poll-data. At the moment there is a quite large uncertainty but is still in favour of Clinton: the probability of winning is between 0.78 and 0.95. If you are interested in the methodology I have used to compute these distributions please see the past posts. 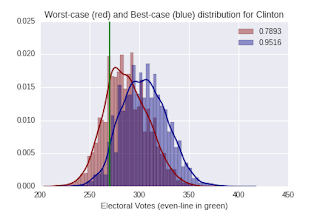 If you want to try yourself, Python code and data-poll from fivethirtyeight.com are available in my github (just click on the links).